Today's publishing infrastructure is rapidly changing. As electronic journals, digital libraries, collaboratories, logic servers, and other knowledge infrastructures emerge on the internet, the key aspects of this transformation need to be identified. Here, the author details the implications that this transformation is having on the creation, dissemination and organization of academic knowledge. The author shows that many established publishing principles need to be given up in order to facilitate this transformation. 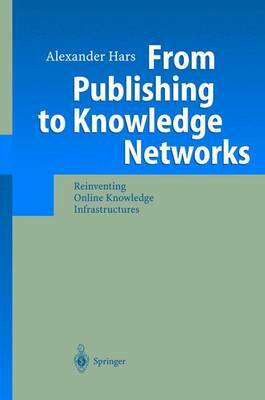 The text provides valuable insights for knowledge managers, designers of internet-based knowledge infrastructures, and professionals in the publishing industry. Researchers will find the scenarios and implications for research processes stimulating and thought-provoking.